Wichita's Leading “Hairstylist to the Dead” is Back With a New Hair-Raising Mystery. No one would call Hilde Higgins an “ordinary” hairstylist — not with her own purple-streaked locks, punkish clothing, weird love of SPAM salad sandwiches, and long list of soon-to-be-buried clients at funeral homes throughout Wichita, Kansas. To top the list of oddities off, Hilde has a rather unusual phobia — she has an unexplainable fear of clowns. Hilde also has a knack for getting herself into unusual situations — like finding the clown-clad corpse of Harold “Binky” Tuttwiler in a cemetery. 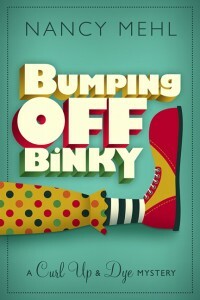 Binky — a local businessman who moonlights as a volunteer clown at the children’s hospital — had clearly been murdered. The police quickly zero-in on a prime suspect: Adam Sawyer, a handsome stockbroker who also dresses up as a clown to entertain sick kids. The very same Adam Sawyer who is Hilde’s new boyfriend. Once again, Hilde is forced to switch from hairdressing to sleuthing, because only she can discover who really bumped-off Binky. Can Hilde solve the mystery before a Kansas twister blows all the evidence away? Hilde is a realistic heroine, a bookworm, who is thoughtful, caring, and sweet. I couldn't help but care for her as she struggled to prove Adam innocent before the police proved he was guilty. If you like to read cozy mysteries, you won't want to miss.” — Susan Sleeman, “The Suspense Zone.